6Then he said to me, “This is the word of the LORD to Zerubbabel: Not by might, nor by power, but by my Spirit, says the LORD of hosts. God has definitely grown me over the past two years. I love seeking the Lord in his Word and in prayer. His leading by the power of the Holy Spirit has stretched me as I yearn to grow to be like my Jesus. Writing is one of my passions and I always want to keep writing. Savor the Savior has allowed me to post what the Lord has placed on my heart and share some of the evangelism experiences. I really want to do more writing in the area of biblical application, devotional, bible study, and as the Lord leads. One goal I would like to set in my lifetime is to write one Christian book. The Lord is showing me in prayer and devotional times to dig deeper in prayer and personal bible devotions. Deeper interaction with the Lord leads to his guidance in growing to be more like Him. I am thankful for Calvary Chapel movement in their passion for being led and empowered by the Holy Spirit. They have also a deep passion for deep study of the Bible(book by book, chapter by chapter, verse by verse, precept upon precept). Some of the great past Christian preachers and writers have influenced me deeply to blog and eventually bring these ideas from the blogs into a book. (Maybe more than one if the Lord allows). Some of these past Christian writers/preachers are A.W. Tozer, Leonard Ravenhill, and David Wilkerson. These three have had a deep prayer life and time in God’s Word. By these two factors men become Spirit-led men in proclaiming repentance and faith in the Lord. Thank you to all for your readership, comments, encouragements, and prayers. A new blog will be formed shortly. I will post here on Savor the Savior, Facebook and email on the new blog. 22 To the weak I became weak, that I might win the weak. I have become all things to all people, that by all means I might save some. While Saturday morning and night over 1000 tracts and handful of Gospel of John were distributed, many will throw away or tear up the message of “Jesus Christ and him crucified” for their eternal souls. Yet, some will either keep the gospel message or recall later what they tossed on the ground. I take part in the Great Commission in seeing people saved. Yet it is truly Jesus will be someone’s Savior. The Lord allows me to take part in the fishing expedition of souls bound for the wrath of God and the Lake of Fire to partake in the decision of a unsaved person accepting or rejecting the offer given to all men to call upon the name of Jesus. On Saturday evening, I believe the Lord allowed me to encounter one of the “some“. The young man was leaving the Copper Cellar and I had in my hand a gospel tract. The tract had a Christmas theme written by Billy Graham and contained the Calvary Chapel business card. The young man asked what it was and I told him it is a gospel tract. I encouraged him to read it to see what it contained. I smiled and left him to read it. As I was walking away he propped himself against the retaining wall to read the tract. After watching for a minute, I could see the Holy Spirit working in the young man as he took the time to read the contents. I prayed for him as I journeyed on to hand out more gospel literature to college students and those eating and drinking in the local venues. Some times to get the one lost sheep, you have to go push through the 99 sheep. The evil spiritual forces will use the other lost to prevent you to getting to the one that is on the verge of turning from being a black sheep to a white sheep. It is only by the power of God, I was able to reach the one lost young man to present him with the eternal change from darkness to light. I have been listening to Greg Laurie radio shows the past several days. He is a Calvary Chapel Evangelist. He has been really focusing on Evangelism in the area of biblical love. Many perceive Evangelists as harsh and unloving. Looking back in the Gospels we see how Jesus was truthful with those he interacted, yet he was very loving in how he presented the people’s issues or lifestyles. It has been said by one evangelist in the past was when we preach “hell”, we should do it with tears and a cry in our voice. Just as you would warn somebody driving down the road and wave them down at the side of the road. Telling them that the bridge is out at the end of the road and if they continued down that direction, they would crash and burn. One of the ways I have seen the Lord get the attention of the people I encounter is allowing the Holy Spirit to lead the conversation, not my flesh. When we get in the flesh is when the message can get muddled. (God can still use the situation if we mess up.) Yet, when we follow Zechariah 4:6 “Not by might, nor by power, but by MY SPIRIT SAYS THE LORD OF HOSTS” God will be faithful to honor those submitting to his loving and guiding hands. The evening at the Knox County Detention Center was a tremendous blessing. The Lord allowed me to share with several men the Word of God, spiritual encouragement, and prayer. The Lord laid on my heart to read to many of the men a Psalm from the book of Psalms. I prayed for the Lord to let me read the Psalm which would speak directly to the heart and soul of each man. Many of the men received a New Testament Bible and a new believer took a new believer guidebook in helping him on his Christian walk. I left rejoicing and praising God that men behind bars are more free, by Jesus Christ, than they were on the outside. After leaving the Knoxville Detention Center, the Lord gave me the physical, spiritual, and emotional strength to top off the night by Evangelizing down on the Cumberland Strip. Handfuls of tracts were passed out. I had a variety of tracts from different organizations and businesses. When I finished handing out tracts, I stood on two different street corners and started reading the Bible. After the second place I stood was directly across four bars, a Taco Bell, and a liquor store. One man kept yelling at me as he walked by…..”No one can hear you, no one can hear you! (He was singing the statement over and over.) I called out to him that “Jesus loves him” and “I follow Jesus and not him by obey his Word to publicly proclaim his Word in the streets”. Both men entered the bar of their choice to fill themselves with alcoholic spirits instead of choosing to continue to listen to the Word and be saved and be filled with the Spirit of God. One incident that shook me as I was walking down the strip was seeing a young person that attended our church. The young person was with a group of friends. They waved and smiled at me as we walked by each other. I gave them a gospel tract created by some Calvary Chapel people. The tract is called “The Man of Salvation”. For some reason seeing this person down near the bar areas concerned me and I quietly prayed for them. I do not know why they were out in the college bar section as I knew they were of high school age. It brought my attention to see how the men in jail for the crimes they have committed have a more willing ear and broken heart to love of God and the Gospel. The men with a personal walk and repentance in Jesus are truly free. It also brought my attention to see how people going to bars and elsewhere in public are very closed to the Gospel message. They believe they have found freedom in having the ability to do whatever they desire and with no care for the consequences following feeding on the flesh. Sure, many like the church friend I saw participating in negative worldly activities, may feel that by going to church on a Sunday or any other religious ritual then be able to do whatever their heart desires the rest of the week. These bar hoping people are not truly free. They are in chains and prisoners to their flesh than those behind jail bars finding true freedom in Jesus Christ. My old worldly days was going to church on Sundays and Wednesdays followed by going to alcohol bars and strip joints on the rest of the week. God’s Word speaks on having a “fence rider”/”one foot in church the other in the world” mentality. His tracts are in the shape of business cards. They are very well made out of a coated covering to last long. One guy in front of Yee Haw lithograph shop was drinking openly in public. We gave him a tract, he cussed and gave the tract back. Many others took the tracts, few rejected, God was glorified. With Spring upon us and this being Easter weekend, I am excited at the awesome Gospel door openings God allowed on this Good Friday. I always pray up and let the Holy Spirit fill me up before any Evangelistic opportunities. Thank you Jesus for the wonderful weather. On this Easter weekend was also First Friday in downtown Knoxville. However, prior to going down to Market Square for First Friday, I went on the UT strip and handed out Gospel Tracts. After a quick lunch at Krystal, I proceeded to Downtown to meet up with Jim Shannon(Another Calvary Chapel Knoxville attendee.) to pass out tracts on Market Square and Gay Street. 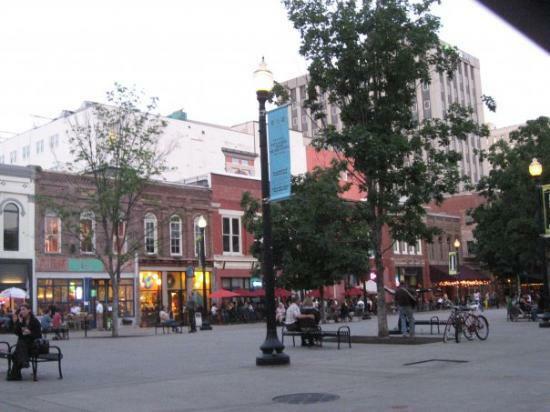 First Friday in Downtown Knoxville is a monthly event where the artsy people show off their art work and musicians play out in the open. On top of this going on downtown, An ecumenical “Stations of the Cross” services was being conducted. These two events on a sunny day was an open door to spread the Gospel. Thank you, Jesus for the great open doors in Knoxville. I estimated Jim and I confronted over 10o persons with a Gospel tract. One little boy came up to us and wanted one each of the different tracts we possessed. One young college age man was given a tract. He had a bottle of beer in his other hand. He was a little buzzed. A few moments later he returned to give us back the tract. He said he was a Christian. Yet, he was scared and apologized to us for drinking. His conscience was working overtime on him. He asked us about if drinking was a sin. We told him what the bible says about drunkenness. He gave us back the tract. Five minutes passed and he came back to us asking for the tract back. This was a first for me to have someone ask for a tract back that he returned to us after giving it to him in the first place. We told him he was invited to attend Easter service at the Bijou Theater this Sunday at 10 a.m.(Anyone reading this in driving distance is invited as well.) We prayed for this man Salvation and Repentance. Those in attendance for the Stations of the Cross services in Market Square were walking from each station in a dead religious shuffle. God started to work in me to bring joy to these people of the power of the resurrected Jesus to enter their lives. I handed as many tracts to these gloomy people. They needed the love and JOYFUL power of Jesus in their lives. Jesus is ALIVE! He has overcome the grave. The people need to know this fact. The Catholic priests conducting the service gave me the impression of dead religion, not the powerful relationship God wants to bring to the people. I look forward in the next couple of hours for God to guide me to share the Gospel with the college kids heading to the bars to drink and party. I love Jesus and I love people so much I want to tell them of the love of Jesus through his death, burial, and resurrection. People need faith in Jesus with godly sorrow(repentance) to escape the wrath of God and enter into Heaven. Pray for me. Pray for those I share the Gospel. I want to remain humble, flexible and always go in the power of the Holy Spirit in being an Evangelist. Pray for me and hopefully God will provide the opportunity for me to be a full-time preacher. I am not fully satisfied unless I am proclaiming my faith in Jesus and sharing God’s Word to a dying world. If God wills, I want to be a full-time preacher/teacher. This goes beyond feeling called, I know within my heart, mind, soul, and spirit that God has called me to the ministry. Ever since in July of 1996, when I talked back home in Carl Junction to my then pastor, Bob Simon that I believed God has called me to the ministry. Like Joseph and the dream God gave him and how long it took God to shape Joseph for his calling, God has shaped me and is continuing to shape me to be molded in his image. I have prayed to God if there is any other career he wants me to be in besides in the ministry, He needs to make it clear as day. So far nothing else is going to bring me the satisfaction as my calling to be in the ministry and telling others about the redemption of their lives through Jesus Christ. The Lord gave me a little over an hour to hand out Billy Graham “Decision” magazines and some Million Dollar Bills on Market Square. I prayed for people to not mistake me for a Jehovah Witness handing out “Watchtower” magazines. I gave away all my stack of “Decision” magazines(about 25 copies.) No one really stuck around to talk or return to ask me questions. I don’t make an effort to make notches on my belt for new converts. God gives me the opportunity to do spiritual “tilling” of the market square “garden”. I remember as a young teen during the springtime, dad would get out the rototiller and break up the rocky ground in our backyard to plant a garden. As my dad would till the ground, my brother and I would have to grab the big rocks out of the garden. For vegetables to grow properly, you have to breakup the stony ground. The same applies to evangelism. As I was leaving Market Square, it started to rain. This is a great reminder to me. God let me plant some seeds and God watered the seeds. Pray for the spiritual fruit to grow and blossom. Now you may ask, “Where does the vomit play into street witnessing?” The next morning I woke up with a headache. I still went to the morning street evangelism class at Calvary Baptist Student Center. My headache proceeded to get worse. The moment I entered my car is the moment I stuck my head out of the car and returned the pancakes and sausage onto the ground. Gross, T.M.I., Robert. I need to bring this up(oops. Sorry again.) to tell you the Christian walk is not all rosy. When you give your life to Jesus in Christian service, expect to be attacked by the enemy. I have become temporarily ill the past few times I go out and witness to people, experienced car problems, and encountered spiritual warfare in various others means. I know it is not the flu or something I ate to make me sick, the past other times I got this sick was when it involved street witnessing. You may say to me, “Use Germ-X.” It may sound like a good precaution, yet if Satan and his demons want to fight back, they will use any method to discourage or stop the witnessing. I am not going to stop sharing about my Jesus. I am thankful God allows me to evangelize to people. It humbles me he wants to use me to glorify Him. God may protect you from puking your guts up after sharing your faith, then again he may allow it. I just ask you if you are willing to share your faith are you willing to potentially endure more than just being temporarily ill. You may be thrown in jail as a result of false accusations(I’ve had this happened to me. ), Spit upon, verbally abused, and especially if you are in a hostile country to Christianity: murdered. It is a privilege to bring the Good news of Repentance and faith Jesus. Are you ready?